The Thule Chariot has a reputation that precedes it. Known as the critical piece of sports equipment for active parents, it lives up to all the hype. 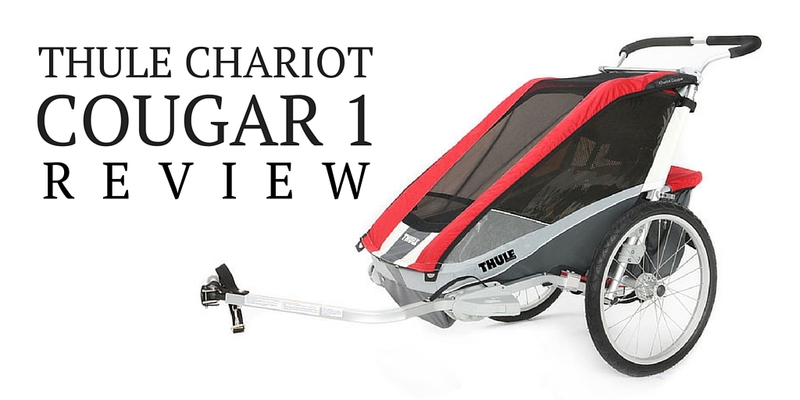 The Chariot isn’t merely a bike trailer–it’s also a jogger, a stroller, and a xc ski trailer. Combine the ski attachment and the bike arm and you can even use it for fat biking in the snow! Like a true yuppy, my husband and I bought our Thule Chariot (the Cougar 1 model) when I was 8 weeks pregnant. No joke. 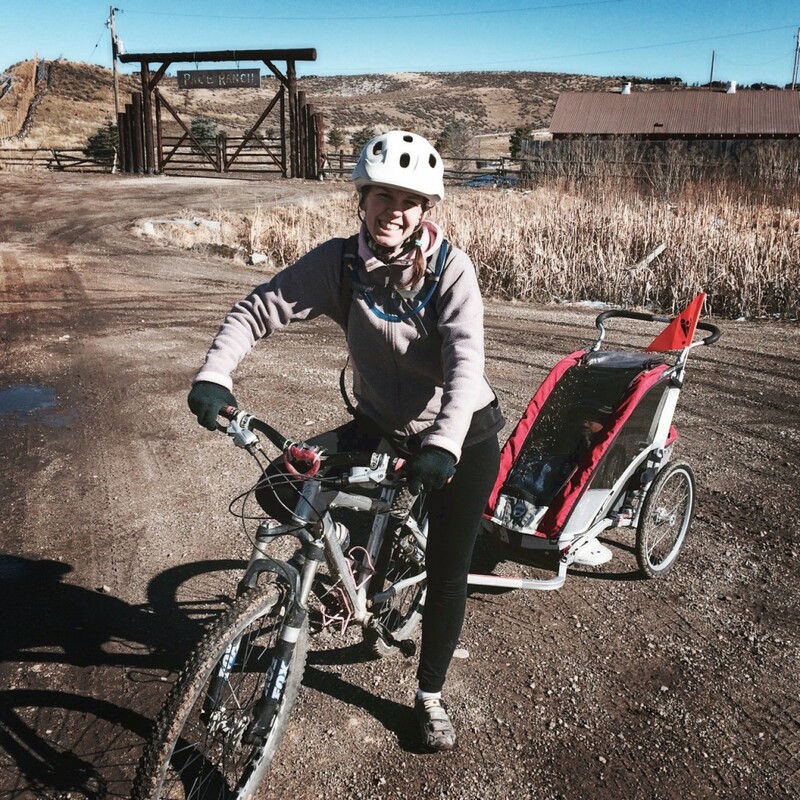 As soon as I saw those two pink lines on the pregnancy test, we hightailed it to REI and used our dividend for the ultimate bike trailer—because there was no way having a child was going to slow me down. (Oh the naiveté)! Nearly four years later, our Chariot Cougar has been though countless hours and miles of hauling a kiddo, a balance bike, library books, picnics, and even groceries. Despite the hefty price tag, I’m happy to say it’s been worth every penny of that REI dividend. Converts for use running, xc skiing, etc. The Thule Chariot has become the quality benchmark that I judge all other kid and family cycling products by, and nothing else quite lives up to it. The construction is quite simply outstanding. Even after 3+ years of tip-overs, rain storms, and muddy doubletrack, the trailer is still in pristine condition. The cover material has remained beautiful with minimal staining and fading. Despite rough transport, toddler abuse, and a few tip-overs, the plastic material on the side windows and the front window has remained intact with no rips or holes. The only damage that we’ve done to the Chariot is a rip in the foam on the jogging handle–and even that’s not too bad. One could reasonably expect to sell their Chariot once they are done with it for fair price considering how well it holds up over time. One of the things that sets the Chariot Cougar apart from cheaper trailers is the suspension system. The adjustable weight settings provide ultimate comfort for the rider even as they grow. Our family has done lots of rides on doubletrack and bumpy dirt roads, and my son has never complained about being rattled. (I can’t say the same for other products we’ve used). If you plan on using your trailer on anything but smooth bike path, I would highly recommend spending the extra money for suspension. If you use your trailer enough, you’re eventually going to need to haul more than just a kid. Thankfully, the Chariot Cougar has plenty of storage space. The large rear “trunk” can hold a couple bags of groceries or both your kids schoolbag and your laptop case. We also use it quite frequently to carry my son’s bike once he’s tired of riding. When it’s not in use, the rear storage compartment can be folded up to take up less space. There are also several mesh pockets, both externally and internally. When running, I use the outside pocket to carry my phone, wallet, water bottle, and jacket. The inside pockets are large enough to carry a kids water bottle, snacks, toys, pacifiers, etc. The Thule Chariot Cougar 1 boasts a 5-point harness to securely hold your child in place. As I’ve already mentioned, we’ve managed to tip the trailer a few times, and my little guy has always been held firmly in place. We’ve never had a more serious accident (car collision, etc), but I’ve heard the Chariot does remarkably well even in those scenarios. The other safety feature of the Thule Chariot is how visible it is. It comes standard with a safety flag (that can be removed for running, etc), and has built in reflective strips. That said, when biking in low light conditions, I always put a couple blinky lights on it and I’ve seen other parents who’ve added additional reflective tape to the trailer. I’ll be the first to tell you that I’m not very mechanically inclined, BUT even I’m able to easily and quickly tear the Chariot apart for transport or storage. The wheels are removable with an easy push of a button. The handlebars and towing bar are slightly more challenging, but still doable. It still takes up quite a bit of room once folded, but fits easily in the rear of my Ford Escape. If you live in a small apartment without much storage space, you might want to look for a more compact child carrier (like a bike seat), but for anyone with a garage you should have plenty of space to store it. The Thule Chariot is an all-around sports machine! If you like to bike, run, hike, and xc ski, this is the product for you. Even though the Chariot is expensive, it is not as expensive as buying a trailer and jogger separately. I use it probably more often for running than I do for biking and it is easy to maneuver and can handle off-road runs with ease. The other accessory that I’ve used is the infant sling. It holds babies in a hammock-like position until they are old enough to properly support their head while seated upright. Thule markets the sling for use in stroller-mode only, but I’ll admit to frequently using it with the jogger from like Week 1 postpartum. To each their own. While I’ve never personally tried it, I’ve seen the xc ski kit in action and it is pretty slick. I see it used frequently on the winter trails around Salt Lake and Park City. 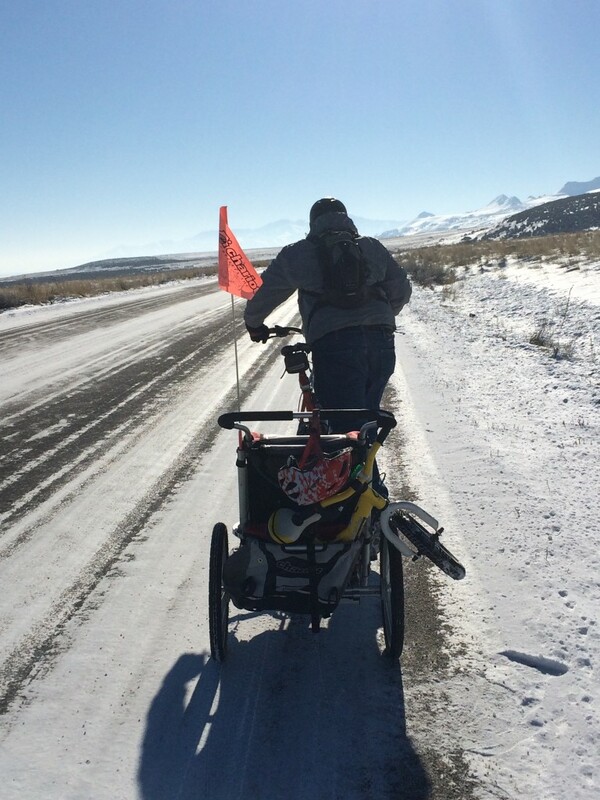 Some adventurous families even use the ski kit for fat biking. Which brings me to my next point….. There isn’t a weather condition that we haven’t used the Chariot in—extreme heat, dust storms, rain, snow, and hail. Even in significant rain storms, my little boy has stayed toasty and warm thanks to the plastic door cover. In sun, there is a smaller shade cover that provides just enough coverage to keep sun out of little one’s eyes and prevent a sunburn. While we prefer our iBert and Weehoo to a trailer, there is one time of year we use the Chariot almost exclusively: winter. With a couple of blankets, some hot chocolate, and the plastic door cover, my little guy stays snug and warm. Thule also has several other trailer models you might consider. In the single child category, the Cougar falls in the middle of the lower priced Cheetah model and the higher priced CX model. In my opinion, the Cougar hits the sweet spot in between. If you have more than one child, consider one of the double models. Cheetah 1 1 $490 Bicycle and strolling kits included. 5-point harness, adjustable handlebar. Cheetah features plus adjustable suspension, partial window venting, and on-trailer accessory storage. CX 1 1 $1,100 Cougar features plus disc brakes, full side window venting, and additional padding in seat. Cheetah 2 2 $590 Bicycle and strolling kits included. 5-point harnesses, adjustable handlebar. Cougar 2 2 $790 Cheetah features plus adjustable suspension, partial window venting, and on-trailer accessory storage. CX 2 2 $1,200 Cougar features plus disc brakes, full side window venting, and additional padding in seat. If you can afford it, there are very few cons associated with the Thule Chariot Cougar. Of course, this is NOT a budget trailer and there are other options that might fit your needs at a much lower price-point. The biggest con in my mind has nothing to do with the Chariot in particular, but with trailers in general. 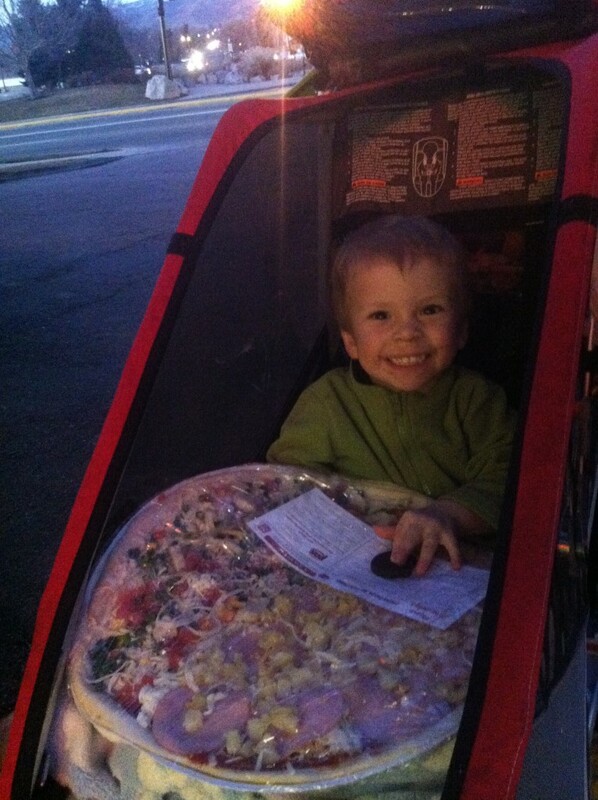 We do use our trailer quite often, but it is not my favorite method of transporting a kiddo. In a trailer, your child is back away from you and it is hard to interact with them. Likewise, it’s my experience that kids in a trailer don’t engage with the experience and get bored quickly. For little ones, I far prefer a front-mounted bike seat; and for older kids, I like a trailer-cycle where they can be involved in the experience. 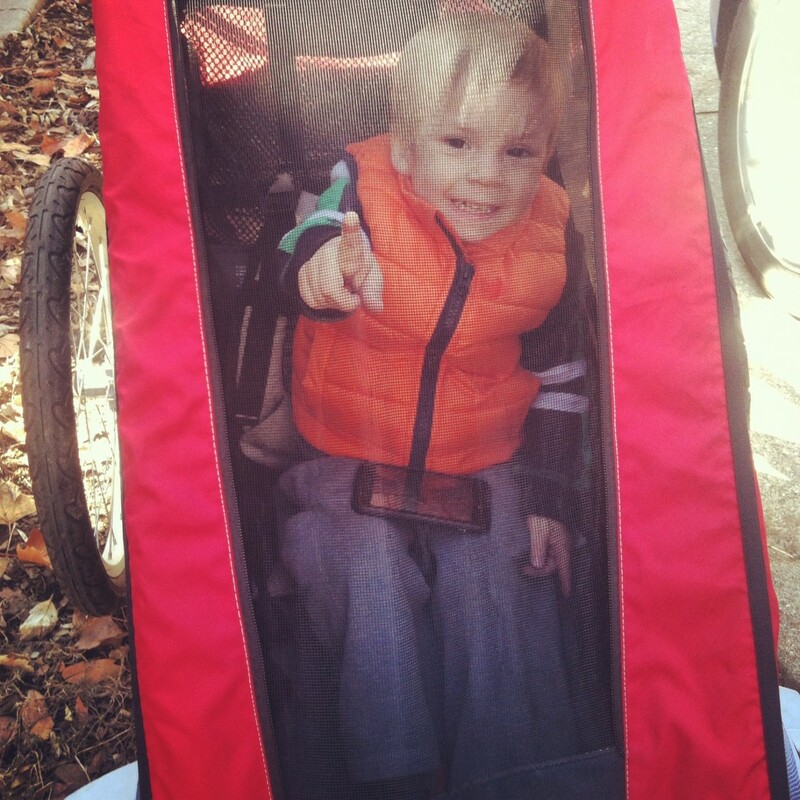 For families that do a lot of bike commuting, a cargo bike should also be considered. The Thule Chariot Cougar is a super-high-quality bike trailer that can also be converted to a jogger, stroller, and xc ski trailer. For those who can afford the high price tag, the Chariot is well worth the investment and will last for years. You’ll be treating your prince or princess right with this ride. My daughter (2.7 years old) and I can attest to the construction of the Thule Cougar trailer. We were going around a corner (at a moderate speed and angle) when one or both of the trailer wheels seized. The result was the trailer tipping over (by the way the tether strap appeared after the incident, it probably did a full flip) and landing on its side. My daughter was unfazed and we were both were left asking “what happened?” I couldn’t find anything on the road to have caused the seizure (could have been a stick or chunk of gravel) but regardless it was a little scary. Thankfully the roll over cage and dimensions of the trailer prevented my daughter from being hurt. Thanks for the feedback! I’ve had this happen (several times), and it’s a little scary when you see the trailer go over, but the kid is usually laughing. At what age did you start using this trailer with your son? Would you recommend it for a baby 6 months old? I am trying to figure out how to bike with a baby. How does the infant sling work? Thanks! We didn’t start using the Chariot until my son was closer to one which is what the AAP recommends. That said, if I were to do it again, I would definitely bike with him sooner. You can check out my blog post on biking with babies for more info (https://rascalrides.com/when-can-you-start-biking-with-a-baby/). But in short, yes the infant sling is a good option. Another, perphas even more secure option, is to just strap your baby’s carset into the trailer.